Alice is currently a Reiki Master Teacher, the Executive Director of Reiki Awakening Academy (ReikiAwakeningAcademy.com), and the creator of the A Moment for Me – Care for Busy People products (AMoment4Me.com). She’s also the inventor and writer of the Apples to Apples: Jewish Edition games, and the writer and composer of 22 original Jewish youth theater musicals. Alice has a Master’s Degree in Jewish Studies, and a BFA in Music and Theater Arts and Drama. She studied Bibliodrama for two summers, learning to create drama from text study. She has authored an award-winning book on Reiki healing (Practical Reiki won 2nd place for Best Reiki book in the About.com Reader's Choice Awards), a book of inspirational poetry, and several books for the A Moment for Me series. First Family is Alice’s first published work of fiction. First Family by Alice Langholt is a thought provoking look at the events as they might have happened between Adam and Eve in the Garden of Eden. If you have ever wondered why God banished Adam and Eve, how the snake had such influence as to make Eve eat the fruit, what were Cain and Abel really like, and why did one brother kill another then you MUST read this book. Adam, Eve, Cain and Abel were given personalities that seemed logical and real. As they learned to live outside of Eden, they had no choice but to figure out how to stay warm, how to find food, how to love each other, and how to survive. Their personalities, quirks, ideas, and feelings made them real and believable under the circumstances they were forced into. Adam truly loved Eve and tried to take care of her as best as he knew how. Eve was a good wife and loved her two boys with all of her heart. Cain was an angry young man who was jealous of his sweet and kind brother Abel. God was always present and watching over them, but sometimes it was hard for Him to leave them alone to deal with their own free will decisions. I really enjoyed First Family and will think of Adam and Eve as real life people with personalities forevermore. I can only hope that Alice Langholt will write a book for each of the people in the Bible, bringing them to life in a perfect scenario without changing or modernizing the story. First Family should be read by everyone - believers as well as non-believers - because it is that good. First Family and Alice Langholt have quickly and easily jumped to the top of my favorite book list. I believe it will to yours too. First Family is a modern midrash (interpretive expansion) on the stories of Adam and Eve in the Book of Genesis. But unlike classical midrash, which take peculiarities in the text as their jumping-off point, First Family takes its cues from the allusive imagery in the text. It uses imagination to fill in the missing parts of the story: What passed through Eve’s mind when she first ate from the forbidden tree? What transpired between Cain and Abel on the fateful day of the first murder? Alice Langholt gets into the minds of the iconic characters and brings them to life. While her Adam is calm and accepting, she brings out the inquisitive and skeptical aspects of Eve. She lets the text guide her in building these characters, but adds her own interpretive embellishment to fill out the missing lines. The book is delightfully well-written; the characters are well-drawn, the pacing is good, and the dialog is believable. For me, the strongest part of the book was the innovative way in which the author tackles the Cain and Abel story. From the few hints in the text, Langholt draws a complex plot, full of irony, tragedy, and heartbreak. For my part, I would have liked to see more use made of some classical midrashim, but of course, the author would then have written a very different sort of book—and quite possibly a less-readable one. First Family is a form of bibliodrama, a technique that has been used in group writing sessions, drama clubs, and even as therapy. The author’s lively dramatization gets the reader involved in the story and builds a sense of participation. But, like all good story-telling, what ends up on the page is just the beginning. I heartily recommend First Family to those who enjoy scriptural interpretation and good story-telling. In addition, I would recommend the book to those who want to try their own hand at bibliodrama--this is how it's done! Wow! Just absolutely wow! I have read a great number of books in my lifetime - First Family has now gone on my list as one of my absolute favorites of all time! So often I've wondered on the experiences of the 'characters' in the Bible, and First Family gives a beautiful and quite powerful look into the minds and hearts of that first story. It has been a number of years since I have read a book that took me on such an emotional journey, and the tears and goosebumps at the end were the virtual cherry on this beautiful written cake! Highly recommended read for a vast number of interests! A lovely read that keeps you engaged word by word, line by line and chapter by chapter all the way until the end. 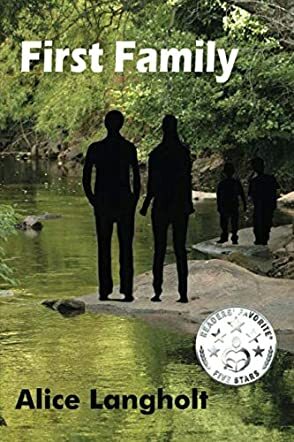 Written in first person narrative, First Family gives the reader a heartfelt account of each character's innocent perceptions of the new world and her bounty. The language hums along and Adam and Eve's realities become your reality. Alice Langholt's writing style encapsulates the reader in such a way that you share in the character's joys and sorrows while marveling at their innate wisdom. A pleasure to read and hats off to the author for recreating such a visual representation of our First Family. The story of Adam and Eve is a familiar one, but I never felt connected to the story until now. The rich and deep language that Alice Langholt uses is immersive. You are there. You walk with them, learn with them, live with them. I absolutely love the individual voices of the characters. Hearing their thoughts from such an individualized perspective in amazing. Alice brings richness and reality to the story. It feels more complete, understandable, reachable. Although I recognize the participants from religious teaching, I do not think I knew them. This story brings them into a much more personal experience for the me, for any reader. Thank you for sharing their lives with me. I really enjoyed First Family! The first-person narrative drew me into the story and held me there until the end. Even though I read the biblical story as a child and later as an adult, this story really does fill in the gaps, so to speak. Langholt's writing style is entrancing as we get to imagine how they discover themselves for the first time; God's reasoning for them having to leave; the relationship between the two brothers; and so much more. It was a literary treat and truly thought provoking! First Family is beautifully written and quite thought provoking. I loved it! The characters came to life and I found myself being able to relate to each of them. The creation story is one most of us were introduced to quite young but it is not a biblical story I have thought much about as an adult, however this book has changed that because Alice has brought a new and multidimensional perspective to each character. Enjoy! Adam and Eve existed in my mind as the scapegoat for original sin. I never thought of them as fully bodied people with the same thoughts and emotions I struggle with. Alice brings them to life in a way that put me in the story with them, experiencing and feeling what they must have felt. This story connects me in a kinder and gentler way to this family as well as to myself and my humanity. It's really beautiful. Thank you for sharing this with us. Alice manages to merge herself into the hearts and minds of the family of the Garden of Eden which allows the reader an intimate connection with the story and the characters. I found myself spell bound and finding meaning that I had missed. having read the story so many years ago. I discounted it as a young girl as a pure creation story , one of many of man's attempt to explain the beginning of time. Alice has brilliantly infused a fresh life into the characters, making them universal and relevant to todays challenges for families. I found myself misty eyed and in wonder as a new awareness of what it would be like to BE Adam , Eve, Cain and Abel and even the dilemna and lessons from the perspective of GOD. As a therapist I have been recommending this book to parents who have lost children or struggled with staggering challenges. I can see this book becoming a movie and being a must read in religious institutions as well as those seeking greater significance in this profound and beloved story. Alice has a unique gift that will benefit generations yet to come.